Welcome to the Crazy Crafters Blog Hop with our Special Guest stamper, the very talented Tracy May - we are thrilled to have her join us this month and so excited to CASE (Copy And Selectively Edit) any project that has been created by her. We hope you find great inspiration from the projects. I had a tough time narrowing down the choices from all the wonderful projects on Tracy's blog - so eventually I chose to combine elements from these two cards to CASE! Click on the images to link to Tracy's blog posts. I took the watercolour background, black and white image and raised element from the card on the left and the layout with the scored left edge from the image on the right. In her posts, Tracy mentions that she herself was inspired by several other people (including Teneale Williams) and so my card also owes something to those people too. The score lines to the left of the card don't show up very well in my photo - but they're there! I'm not sure why I don't use more Wisteria Wonder because I think it's a lovely colour! Here I've combined it with touches of Elegant Eggplant. I cut a piece of Wisteria Wonder cardstock to 9" x 6" and folded it half to create a card 4.5" x 6". I then added three score lines to the front of the card, next to the fold. This card uses the Layering Letters technique, although, lacking letter dies, I used the Swirly Scribbles thinlits instead. I stamped the banner from Basket For You with Basic Black ink onto Shimmery White cardstock and snipped around the lines. I used the matching die from the Bunch of Banners Framelits to cut out an Elegant Eggplant banner and glued the stamped piece to the centre. Using Basic Black ink, I stamped the basket image from the Hostess set Basket For You onto Shimmery White cardstock. I made sure the ink was dry and then watercoloured around the image with Wisteria Wonder and Elegant Eggplant inks. I dried the watercolouring and cut out a shape over the image using one of the Swirly Scribbles Thinlits - being very careful to keep ALL the pieces! I then cut the image three more times using some very heavy weight cardstock that I had tucked away. I'm a hoarder, so most pieces of packaging end up stashed away for just such a purpose! 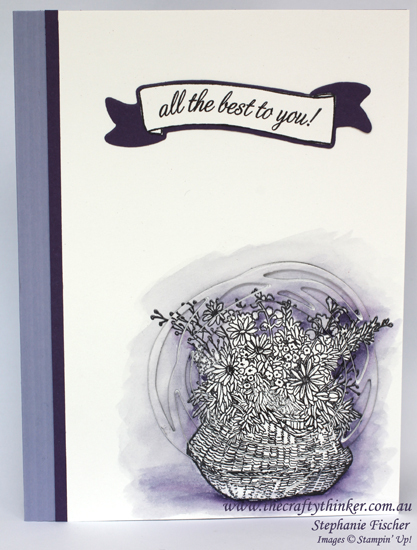 I adhered the stamped cardstock to the Wisteria Wonder card base, glued all the Swirly Scribbles shapes together with the coloured one on top and then glued the shape back into the hole. I then glued all the little patterned pieces of cardstock back into position. I added a thin strip of Elegant Eggplant cardstock to the left of the card and attached the banner. Thank you for visiting. I hope you've enjoyed this card and I welcome your comments.